The Katara Sun Temple is located around 2116 meters above sea level and is the second-most important sun temple, with the Konark Temple in Odisha ranking first. The temple was built in the 9th century by Katarmalla, a Katyuri dynasty king. It is a fine example of intricate structuring with the first rays of the sun falling straight on the temple. The main deity of the temple is Vraddhaditya (the old Sun God). The main temple is surrounded by close to 45 smaller shrines. The temple is a major attraction and is visited by hundreds of devotees throughout the year. The best time to visit is during the day. Other recommended time to visit this temple is in the months of September to October and March to June. How popular is Katarmal Sun Temple? 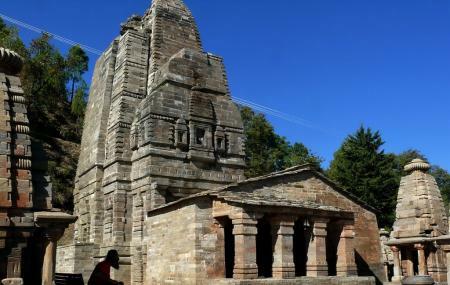 People normally club together Binsar Mahadev Mandir and Kumaon Regimental Centre Museum while planning their visit to Katarmal Sun Temple. Some sights are more than mesmerising, you just want to soak up to it. Such a soul soothing experience. One of the two sun Temple. The brilliant architecture of the temple is one of it's class. The Sun Temple of Katarmal is beautiful and serene. It is located on a hillock that offers some excellent views of the valley below. Another gem of Uttarakhand and relatively with lesser footfalls. One of the handful of sun temples of India, the 9th century temple was built by the Katyuri kings who ruled the region in those times. The Katarmal Sun temple is a complex of small temples clustered around the main temple. The main temple is dedicated to Surya or the Sun God while the smaller temples were dedicated to different Gods and Goddesses of the Hindu pantheon. One of the only two Sun Temples in India... past of building this temple is interesting.. It's a beautiful temple on the top of the hill. Vehicle goes till the top of the hill. Only 1km needs to be covered by walk. There are Maggi and samosa shops at the bottom. Temple has spectacular views. Drinking water is available at the temple.